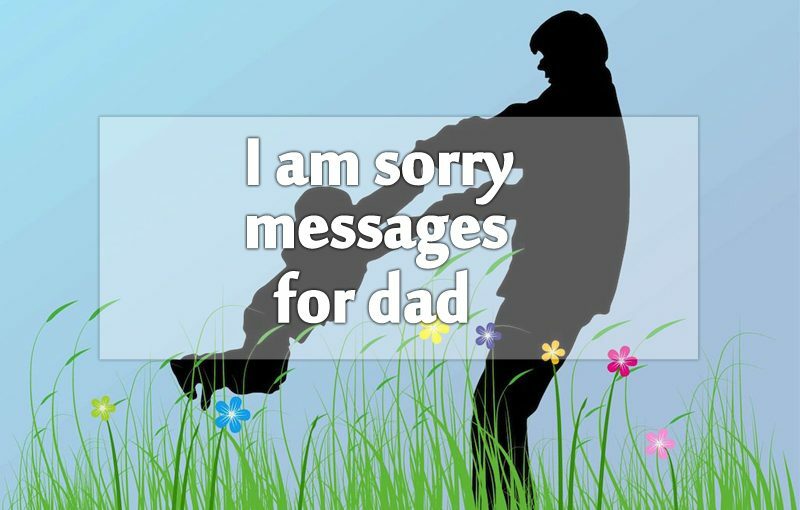 Sorry Messages For Dad : Sorry messages and quotes to use in apology for father. Dad means the shelter, dad means the protection, dad means the shadow and dad mean the most respectable person in everyone’s life. 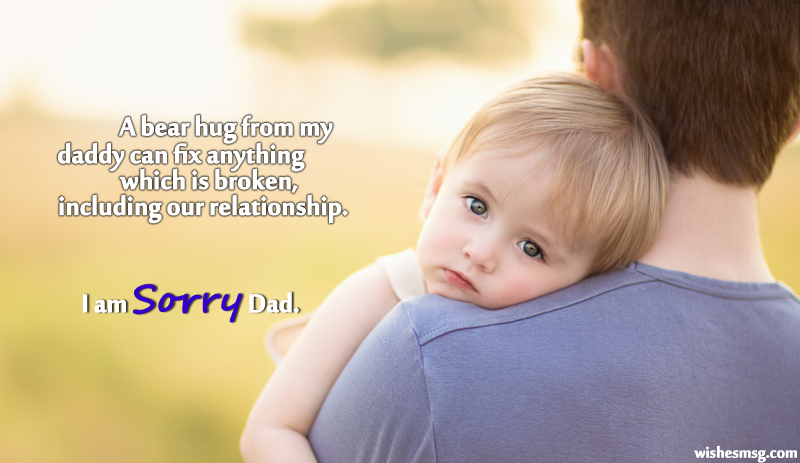 If accidentally you have some misunderstanding with your dad or through your undesired saying or rude behavior just hurt him; then there is nothing more important but to apologize and say heartfelt sorry to your father. In such kind of situation, you may feel what or how to say sorry to your dad. Here are some examples of I am sorry messages for dad what you can use in wording to write sorry messages to your honorable father. Also if you want you can send these I am sorry messages for dad via posting on your dad’s Facebook timeline, email or a sorry card. Whether you want to apologize for any of your wrongdoing these messages will encourage you to take the first step towards fixing your relationship with your father by saying I am sorry dad. Just choose one of the best messages to send your daddy. I am sorry for all the wrong things I did. You are the best father in this world. Please forgive me. I love you, dad. Please don’t be mad at me. I am very much sad. I can’t say you how much I am ashamed and frustrated with my actions. I only can say you sorry father. Please forgive me. I will improve myself. I promise. Dad, I know I don’t deserve your forgiveness. But where will I go without you? How can I live without you? Please forgive me. I am sorry. I love you so much. You taught me a person who apologies are the good men. As they know they are wrong. I am asking for your apology. I know I have done wrong. Will you please forgive me? I am so sorry papa. Daddy, you are a big-hearted man. Can you please forgive me and give me a last chance? I am really sorry. I will never do this. I am very much ashamed and sad. Please give another chance. I will not do this again. I know you will never be able to forgive my actions but I hope the tears in my eyes will make you forgive my heart. 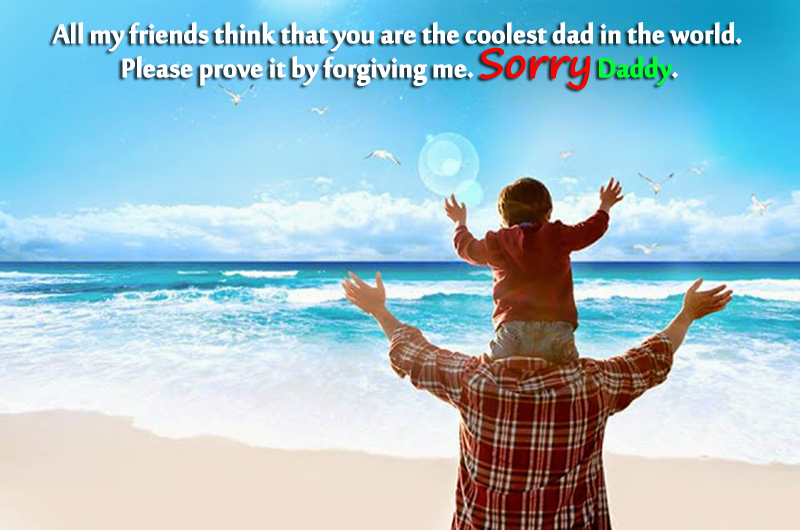 Dad, this apology is for all years I have spent hating you when you spent loving me. I am sorry. You wanted me to be the apple of your eye but my shameful actions have made me the dust beneath your feet. Sorry, dad. A bear hug from my daddy can fix anything which is broken, including our relationship. I am sorry dad. I have been the worst daughter to the best father in the world. Sorry daddy. I haven’t just disrespected you, I have demeaned myself. I haven’t just infuriated you, I have insulted myself. I haven’t just frustrated you, I have failed my own self. Sorry dad. 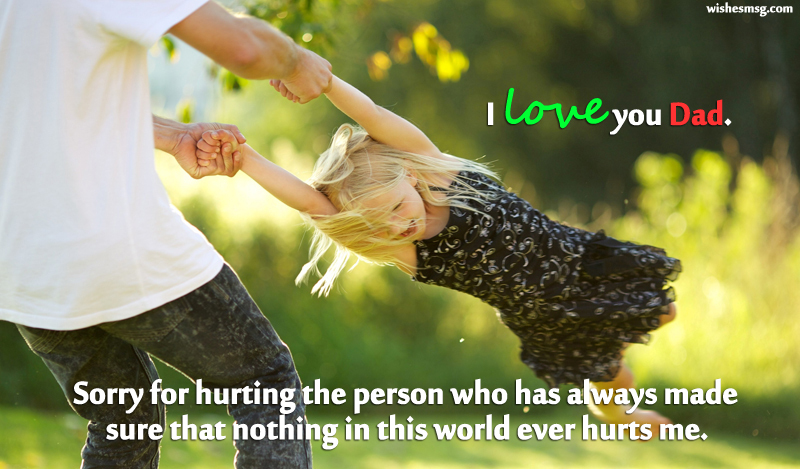 Sorry for hurting the person who has always made sure that nothing in this world ever hurts me. I love you dad. Daddy, a person who hurts someone, feels more burden than the sufferer. I am burning inside. I can’t express my feeling how much I am suffering now for my misbehavior daddy. I am sorry. Please forgive me. Father, you always tell me that nobody is perfect. Everyone has flaws. Everyone makes mistake. I am a human. I have made the terrible mistake as I hurt you. I am sorry my dear father. Please forgive me. I love you. I am incomplete without you dad. It is my fault that I got you in trouble. I don’t know how to say sorry. But you are my dad. Please forgive me, father. I will never do this again. I am really very sorry. Daddy, you are the best teacher of mine. Your silence is killing me. Please accept my apology for my misbehavior. Your silence has taught me again that I am nothing without you and how much I love you. I am sorry dad. I am feeling ashamed of myself. I have hurt my own father. I know I can’t heal your pain. But father I am asking forgiveness from bottom of my heart. Please forgive me. I am so much sorry. Your dreams for me were like a hot air balloon that could rise high above everyone else. But I was the idiot who punctured them with my mistakes over and over again. I am sorry dad. I never meant to tarnish the beautiful colors you added in the hues of my life. Sorry dad. Forgiveness is the greatest virtue is what you have taught me. Won’t you practice what you preach? Sorry. Every time I have deserved a piece of your mind, you have given me a piece of your heart. I am sorry for all the troubles, dad. Just like you have always washed away my tears with your loving words, please wash away my sins with your forgiving hugs. I am sorry dad. I have made a few mistakes in my life, repented for them, fixed them and learned my lessons. But my torture won’t be over until you forgive me. Sorry dad. 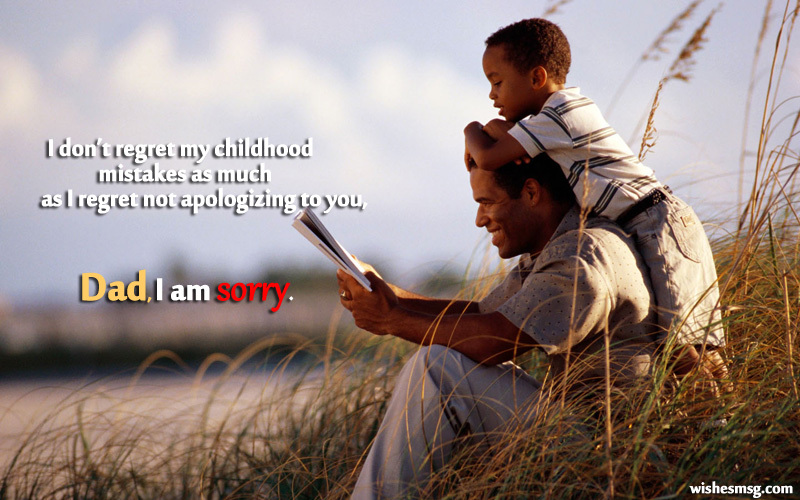 Dear dad, my apology to you is unconditional, just like your love. I am sorry not just because I lied, but because I lied that I didn’t lie. Forgive me, dad. I don’t want to make a false promise to never make mistakes again. But I promise to learn from every single one I have made so far. Dad, I am sorry. Every sale needs a follow-up. Once you buy my excuses, I am going to follow it up with hugs and kisses. Sorry dad. I can proudly say that my father is my biggest strength. It is a shame that my father cannot say the same for me. Sorry dad. You expected me to be an idol of a son, but my actions proved that I am an idiot of a son. Sorry dad. I took your kindness for your weakness, silence for your nonchalance and patience for vulnerability. Sorry to take you for granted, dad. When I hit rock bottom in my life, I thought it was the end. But it was a new beginning in disguise. I learned life’s most important lesson – always listen to your parents. Dad, I am sorry. I am sorry for hardening your heart with fights instead of softening it with hugs. Please forgive me dad. I always knew that you were my punching bag, but I never meant to actually punch you with my mistakes. Sorry dad. You brought me up to be your sweet pea. But I grew up to be your bitter melon. Sorry daddy. Defiantly the relationship between father and son is one of the greatest alliance in human life. Don’t let any mistake to be a crack on it. 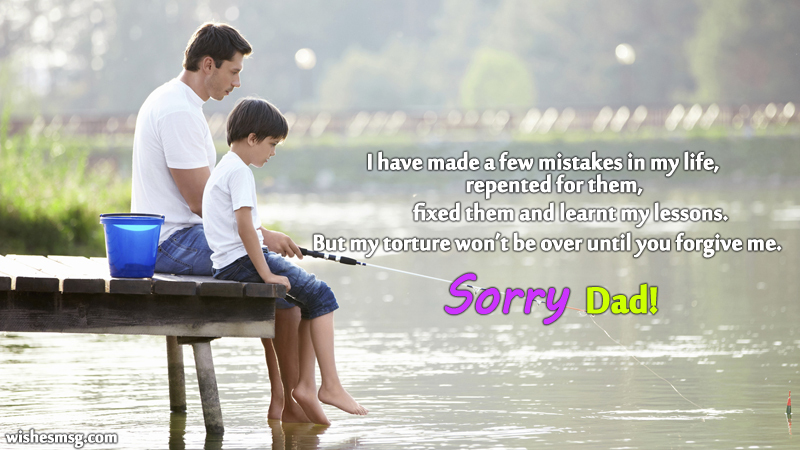 We hope this sorry message for father will help you to make a perfect apology to your father. Wish you best of luck, thanks for staying with us.